Having thundered at a "United India" rally she had organised of 23 Opposition parties in Kolkata, chief minister Mamata Banerjee has pulled out all stops to ensure that the Bharatiya Janata Party (BJP) is defeated in the Darjeeling Lok Sabha, which with its own distinctive political dynamics, has become a fight for prestige for her. Mamata claimed that the BJP’s tally in West Bengal, among certain other states, will be "zero" in the forthcoming general elections. 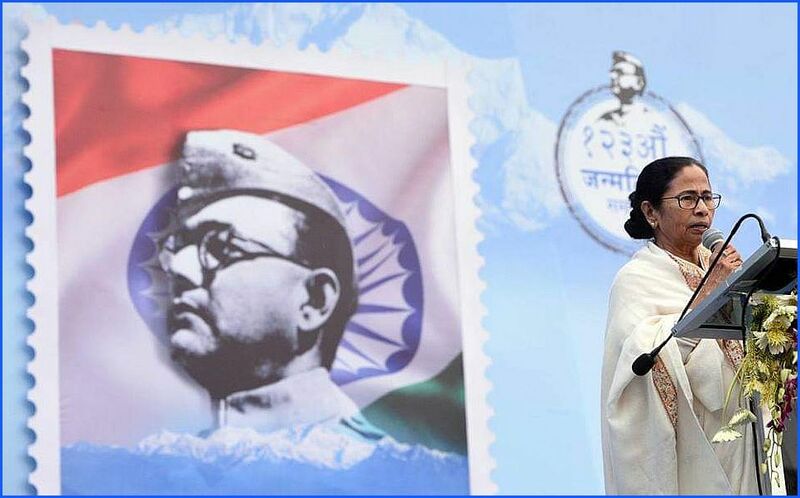 Coming close on the heels of the Kolkata rally, where the gauntlet was thrown at the BJP, the political significance of Mamata's visit to the Darjeeling Hills cannot be overstated, even though a high-point was a public assembly in Darjeeling on Wednesday to commemorate the birth anniversary of Netaji Subhas Chandra Bose. Without mentioning the BJP, Mamata said that “those bent on breaking the country into bits could not provide national leaders." Having won the seat for two successive terms, the BJP seems to have cut a sorry picture for itself in the Hills where the political scenario, ever since the 104-day June-September 2017 agitation for statehood, has been marked with a tussle for supremacy between the regional surrogates of Mamata's Trinamool Congress and the BJP. Not only has the BJP been berated for not living up to the assurances given by Union Home Minister Rajnath Singh in September 2017, when he said that the Centre would be convening tripartite talks to find ways out of the crisis precipitated by the statehood demand. Local BJP MP and Union Minister of State S S Ahluwalia has been held accountable for not having visited the Hills since the agitation. Prime Minister Narendra Modi's remark "the dream of Gorkhas is my dream," while campaigning in the run-up to the last elections, appears to have faded into an echo. Mamata, on the other hand, has made significant strides in regaining her popularity after deeming it prudent to stay away from the region for nearly seven months, during and in the aftermath, of the statehood agitation precipitated by TMC government’s miscalculation of the volatility of the political situation back then. But since, she seems to have successfully out-manoeuvred her detractors, primarily by weaning over support of a dominant section of the leadership of the Gorkha Janmukti Morcha(GJM) — the principal political player in the region — though turning it into a site for a proxy tussle involving her and the BJP. The backing of the GJM is critical for electoral success in the Hills. It is against such a backdrop that the recent commitment by the Binay Tamang-led faction of the GJM to supporting a “third party alliance” in the coming parliamentary polls should be viewed. Tamang, who was anointed by Mamata's helmsman of the Board that runs the affairs of the Gorkhaland Territorial Administration (GTA), a semi-autonomous regional body and for which elections are long overdue, was among those present on the dais of the “United India” Kolkata congregation. Subsequently, he made the GJM’s electoral preference “official”, adding that the GJM, a partner in the NDA for the last ten years, was pulling out of the alliance. On the future of the GTA , Mamata hinted at the Darjeeling rally that augment powers of the GTA was on the cards, stating that 'the accord (for the setting up of the GTA) will be renewed after the Lok Sabha elections. Tamang's announcement of support to the “third party alliance”, however, has been questioned by the opposing faction within the GJM, led by fugitive leader Bimal Gurung. In a social media post shortly after, a leader of the pro-BJP camp, dismissed the announcement, arguing that Tamang is in no position to speak for the GJM as he had been expelled from the party in September 2017. This was rubbished by Tamang asserting that it was he who had replaced Gurung as party chief in deference to a decision of the GJM central committee. Mamata, in the months since the last statehood agitation in 2017, has steadily consolidated her grip over the Hills despite red-lining the demand for a separate state. She has done this by throwing up a collage of authorities locally in the form of committees and development boards for various ethnic communities. They were designed to “protect your (the Gorkha) identity and greater development in the hills”, she said at Wednesday’s rally. The chief minister's moves have been widely construed as attempts to tap into the feelings of bitterness, betrayal and exhaustion spawned by the protracted shutdown and the BJP-led Centre’s failure to address the outstanding problems of the region. These also include New Delhi making little progress in granting tribal status for eleven Hill communities – an issue which is turning into a fulcrum of local politics and which the Tamang-faction of the GJM would like the third party alliance to promote. Presently such a status is enjoyed by about 34 percent of the local population, which could grow to more than 70 percent if the eleven communities are included. “The state government has given the (required) letter (of assent). But till today the Centre has done nothing...Why does it take so long?” she asked. Such a development could facilitate Sixth Schedule status to the region, a demand prioritised by another important local political entity – the Gorkha National Liberation Front (GNLF) – which had spearheaded the statehood campaign in the mid-1980s. It is significant that the leaders who met Mamata in the course of her visit to Darjeeling expressed their satisfaction following the talks, indicating they could support her choice for the coming polls, as was the case in the 2014 elections.